Drumatic 4 is a 10-part drum synth VST available for both Windows and Mac platforms. 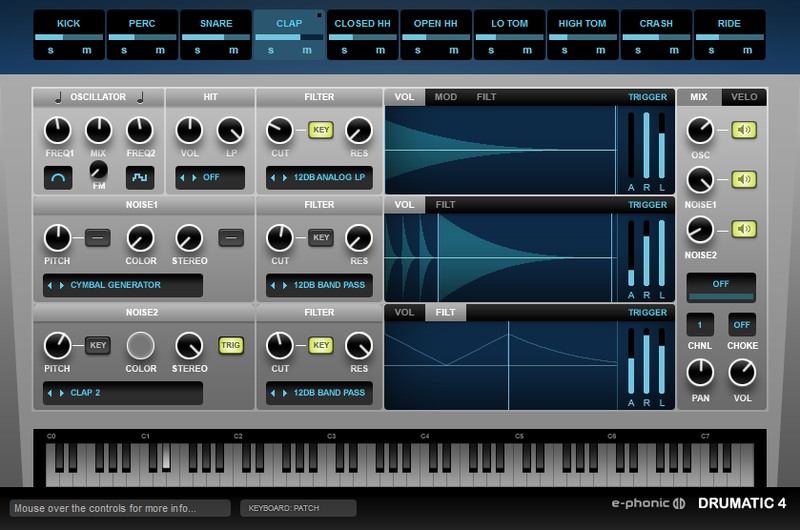 It uses a mix of subtractive, FM and wavetable synthesis to build amazing drum kits. It’s possible to shape each drum part using waveforms, filters, noise generators, and effects, resulting in excellent drum kits, perfect for all types of electronic music. 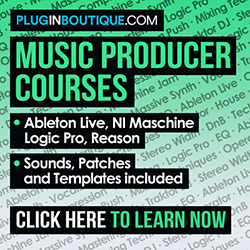 At the top menu, it’s possible to select one of the 10 available drum parts for editing. There are also Mute and Solo controls. The instrument has two oscillators, with seven available waveforms. There are independent controls for frequency setting and a Mix knob. The FM control will set the amount of frequency modulation applied to the oscillators. Hit section will add a tone in the high frequency section. There are four types of hit sounds, with several variations, where the user can set its volume and amount of low pass filter. There’s even a Hit Generator, with modulation and decay settings. Drumatic 4 has two independent Noise generators. The interesting part is that you can use any internal sound as a noise source: snares, kicks, hi hats, claps, not only the typical white noise. There are controls for pitch, color and stereo parameters, as well as a keytrack button. The Filter section has independent settings for oscillators, noise 1 and noise 2, with 12 available filter types. There are Cutoff and Resonance knobs, as well as a keytrack control for filter cutoff. There are independent envelope sections for volume and filters, and also for oscillator modulation. The Mix section at the left shows volume controls for oscillator, noise 1 and noise 2, and also mute buttons. The velocity can be set by clicking on the Velo tab. The drum synth comes with three built-in effects: Crush, Drive and Compressor, with a gain control. There are also Volume, Pan, Channel select (1 to 6) and Choke controls. All of those have independent settings for each drum part. Drumatic 4 has 33 native drum kits, and it’s also possible to save custom kits. You can download a free demo version, fully functional, with a short noise every 30 seconds. Drumatic 4 is available in 32 and 64-bit versions.